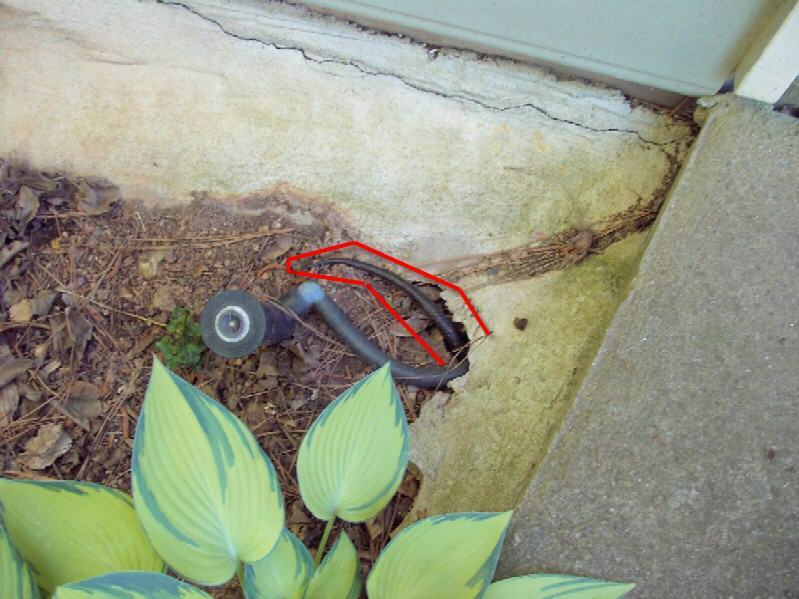 We have discovered where our backyard black rat snake lives. This home is very functional. The snake sleeps inside the hollow trunk above the entrance, protected from raccoons and other predators. The sun room is the old limb just above the entrance (here’s a link to the snake in its sunroom). The laundry room is on the south side of the tree, shown in the photo below. This is where it sheds its skin. Look at how shiny and bright its skin is after shedding its old skin. New clothes! This home also has a front porch. I walked down a path in the woods behind our home when I felt an urge to look at the old pine tree to my right. On the rotten stump of a broken off limb, the black rat snake we saw a week ago in the backyard was quietly watching the world go by. It doesn’t seem to fear us and it is fascinating to be eye-to-eye with such a large reptile. I hope it realizes it is safe on our property and stays around. This black beauty visited our backyard recently. It was about 6 feet long and very relaxed. 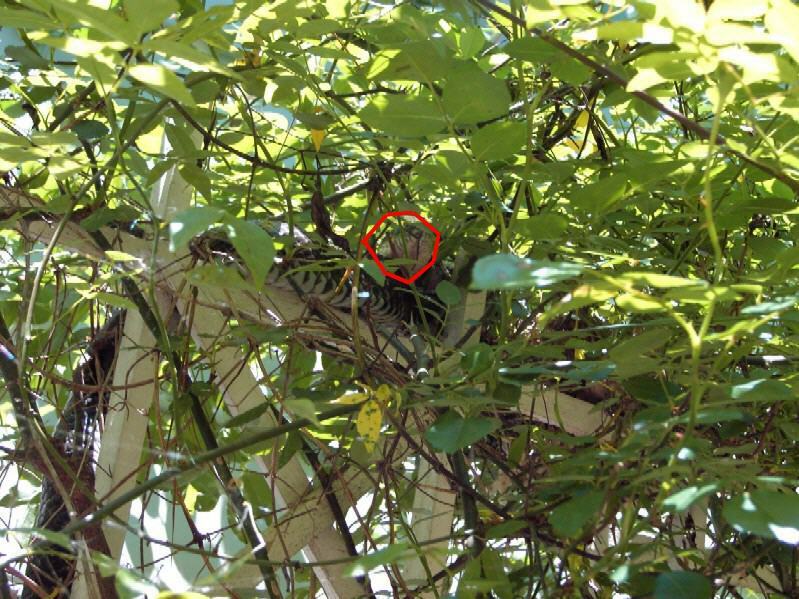 I don’t know if it is the same snake that visited two years ago (here’s the link: Nature in the Backyard). I can’t tell one six foot Black Rat Snake from another, but this one was very mellow and the other one wasn’t. The other one seemed thicker, but that could have been the big meal it had just swallowed. I hope it stays around, it’s always a pleasant surprise to see such a large reptile. On Sunday I was in our side yard when I heard birds screaming in our back yard. The bluejays were the loudest, but all the birds were shrieking. When about a dozen bluejays were started screaming in unison, I decided to investigate. When I stepped into the back yard, I expected to see a Coopers hawk. I didn’t see a hawk, but I did see several cardinals diving into the climbing roses on a trellis against the back of our home. As I walked towards the roses, something appeared out of place. 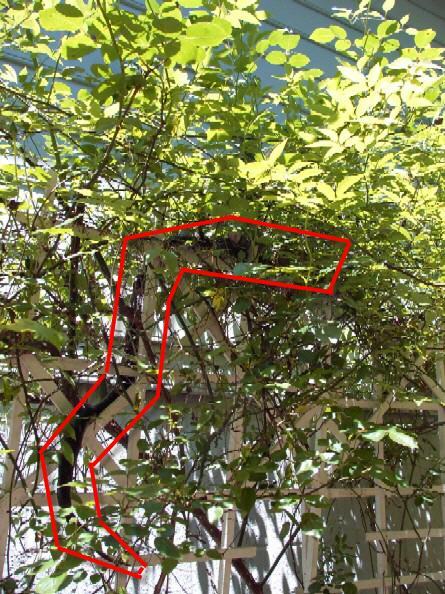 I saw what appeared to be a black tail hanging down at the bottom of the trellis. (Look at the red outline in the first photo – double-click for a closer view.) As I got closer, I saw a large black snake curled around a bird’s nest in the roses. I wanted to get more photos when it came down, so I checked on it often. I expected it to move away from our house, across the yard, and into the woods. Wrong! I spotted the big snake coming around the corner of the garage, towards the the front of the house. I walked over to get a closer look and a photo. It paused for a moment, and then started coming right towards me! Instead of moving onto the driveway where we were standing, however, it went into a hole under the driveway. I was so caught up in the excitement I had forgotten to turn my digital camera on! When it was finally ready, I got a photo of it’s tail as it disappeared in the hole (highlighted in red in the third photo). The next morning I went out and looked at the hole. The snake was about a foot out of the hole. It immediately withdrew into it’s sanctuary. This large snake shows up four days after Scooter is gone. Can predators detect an opening in the ecosystem, an opportunity for upward mobility?